Was used once a year for our family holiday. Stored indoors and always packed away dry. 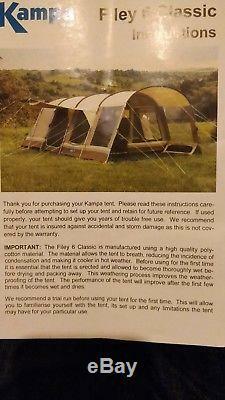 Tent is made from poly cotton. We brought it new in spring 2013. Bag of aluminium poles We have the carpet as well. Have not used it in the last two years, we downsized to give us extra space in our car, when our second child arrived. The item "2013 Filey 6 Classic tent Large family tent" is in sale since Friday, January 12, 2018. This item is in the category "Sporting Goods\Camping & Hiking\Tents & Canopies\Other Tents & Canopies". The seller is "tommyvowles" and is located in Sheringham. This item can't be shipped, the buyer must pick up the item.